Two new homes near Joshua Tree National Park, and one in Pioneertown, offer buyers a modern, off-grid lifestyle. The homes from Baltic Sands, a High Desert design and build company, were sited to capture optimal views of the surrounding landscape. Located at 7250 Lawrence Avenue, within walking distance of Joshua Tree National Park, this two-bedroom, two-bath home is on the market for $565,000. You’d be hard-pressed to find anyone who isn’t inspired by the majestic beauty of Joshua Tree National Park. Jacques and Ewa Marais channeled that inspiration in an innovative direction, opening a High Desert design and build company called Baltic Sands. Jacques, an engineer, and Ewa, an interior designer, originally came to the desert in December 2016 to visit their niece Ida Alwin. 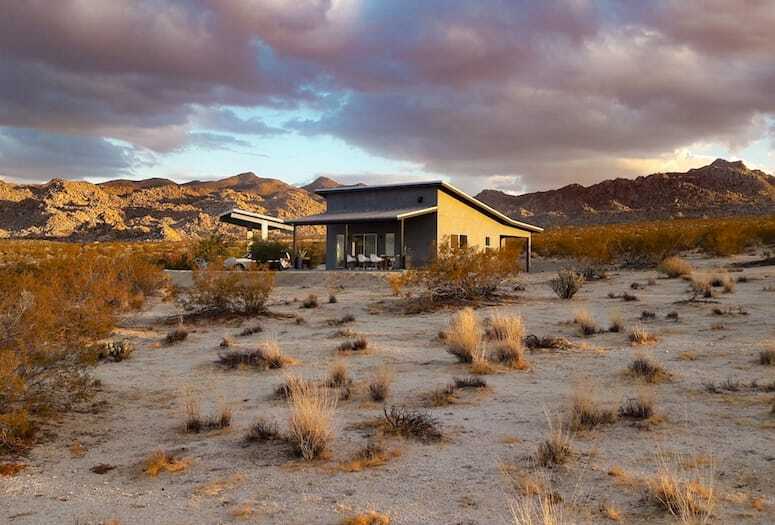 Now, the three have partnered to build several environmentally sensitive, off-grid homes with private wells — two in Joshua Tree and one in Pioneertown. The interior of the homes features tall ceilings and polished concrete floors. 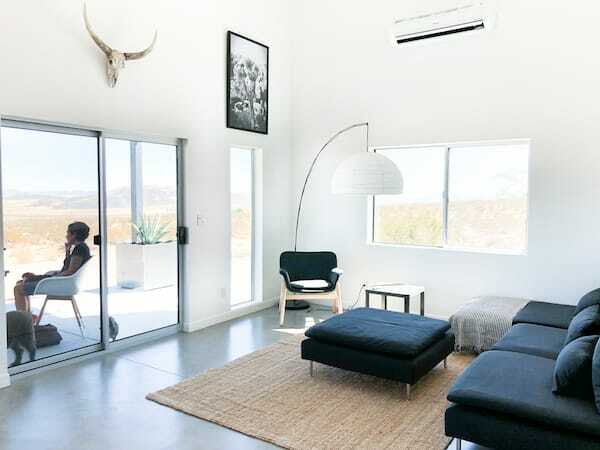 The Joshua Tree 1 house has 14-foot ceilings, polished concrete floors, and two bedrooms and two bathrooms in 980 square feet. “The open-plan kitchen and dining and living areas lead onto a lovely, large patio with 360-degree views,” Alwin says. The kitchen has high-gloss white kitchen cabinets with white stone countertops and stainless steel appliances. The home is currently on the market for $565,000. Joshua Tree 2, which will be completed in March 2019, also has an open plan, polished concrete flooring, and a large patio along with three bedrooms and two bathrooms spread over 1,800 square feet. The kitchen has cedar cabinets, stainless steel appliances, and gray stone countertops that match the color of the flooring. It will be priced at $750,000. Both of the Joshua Tree homes are set on 5-acre lots and are walking distance to the national park. 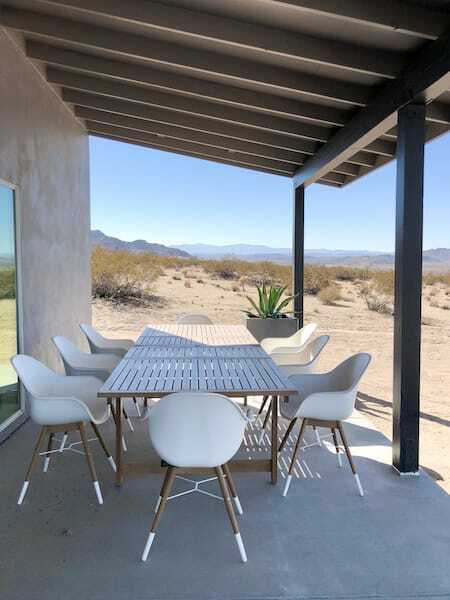 Both of the Joshua Tree houses have patios with open desert views. 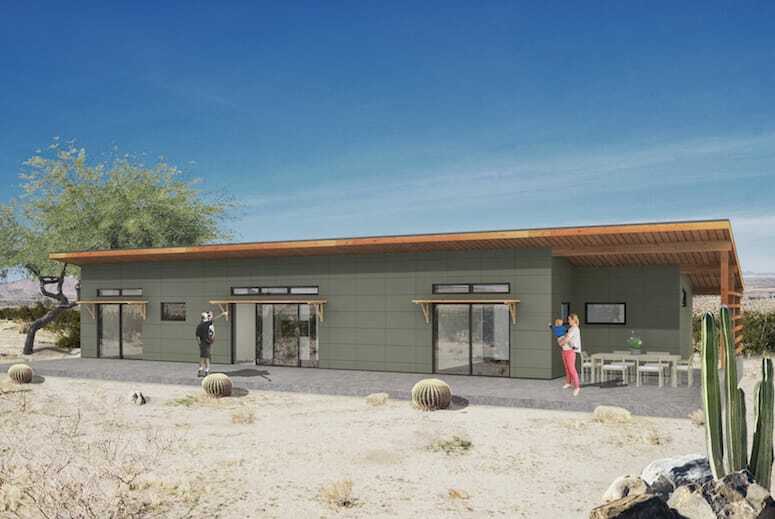 A rendering of Joshua Tree 2 — an 1,800-square-foot three-bedroom, two-bathroom home located at 7190 Lawrence Avenue — that will be completed in March 2019 and priced at $750,000. The Pioneertown home, sited on 3.5 acres, is the largest at 2,800 square feet with three bedrooms and three bathrooms. It will include a large veranda and swimming pool with views of Pipes Canyon and Big Bear. The kitchen will be outfitted with camphor wood cabinets, white stone countertops, and Miele appliances. This house will be ready toward the end of 2019 with an asking price of $1.8 million. 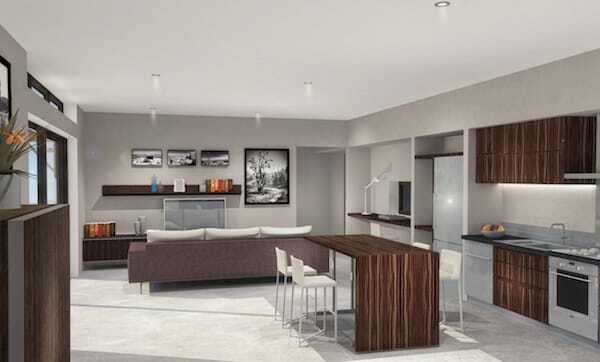 The open floor plan of Joshua Tree 2 includes a kitchen with cedar cabinets, stainless steel appliances, and gray stone countertops that match the color of the polished concrete flooring. 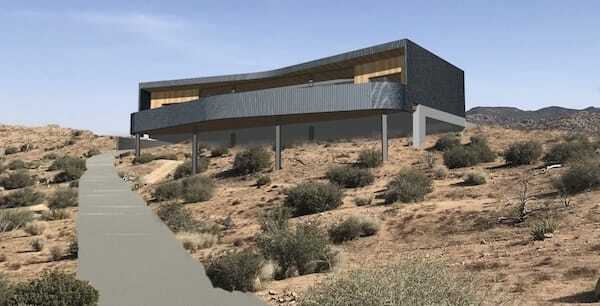 The Pioneertown property will include a large veranda and swimming pool with views of Pipes Canyon and Big Bear. The Pioneertown home, located at 3280 Ox Yoke Way, was designed by Durban, South Africa–based architect Don Albert. Scheduled for completion in late 2019, it will be priced at $1.8 million. For more information, visit balticprop.com or contact Ewa Marais at ewa@balticprop.com or 802-777-5563. For showings, contact Ida Alwin at info@baltic.com or 562-477-8920.